Trying to make changes to our wardrobes can feel overwhelming, and ethical and sustainable brands are at a disadvantage when fast fashion has such an overwhelming presence both online and on the high street. But for those of us who are looking for something a little more personal, both in terms of style and shopping experience, a community of likeminded people are working together to make this happen. Rachel Kan, founder of Style Yourself Sustainable, put together a great event at Hackney Showroom, showcasing many different but stylish options for a more mindful wardrobe. 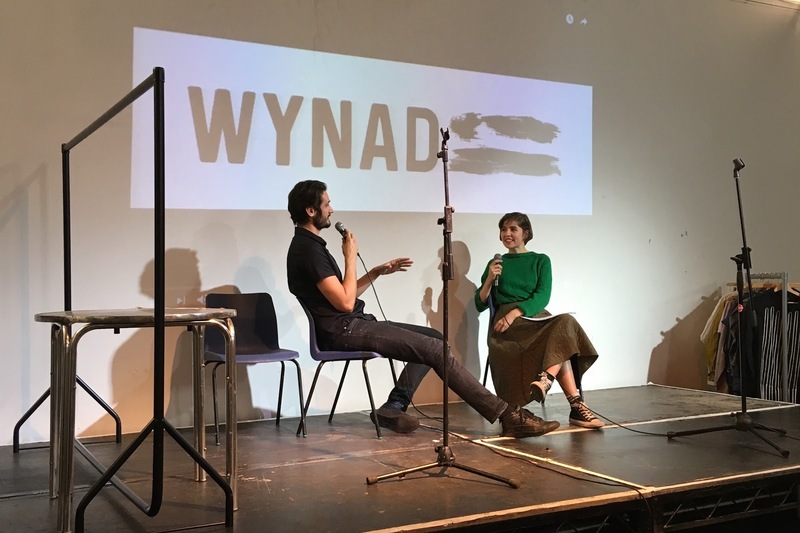 The day included talks, sewing workshops, vintage and sustainable brands, and a swap shop, demonstrating that there are a wide range of solutions to the current problems with the fashion industry. 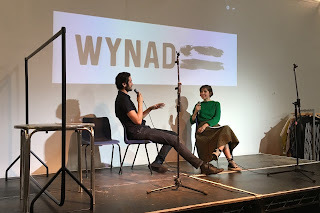 Sustainable brands were represented by Komodo and WYNAD clothing, and Rob from WYNAD, along with Lizzie from We Resonate, Alicia from Bourgeois Boheme and Kate from Fabrikk took to the stage to talk about the stories (and struggles) behind their businesses. Rob spoke honestly about the difficulty of keeping track of the supply chain. He worked with NGOs like SAVE, who were able to direct him to Jacob’s Well, a garment factory which trains and employs vulnerable women and pays them a living wage. He also had to work hard to find a dye house that was environmentally friendly. WYNAD clothing are pioneering the use of Lotus silk, made from the stems of lotus flowers. It is soft and wrinkle-free, and an ideal cruelty-free alternative to traditional silk. 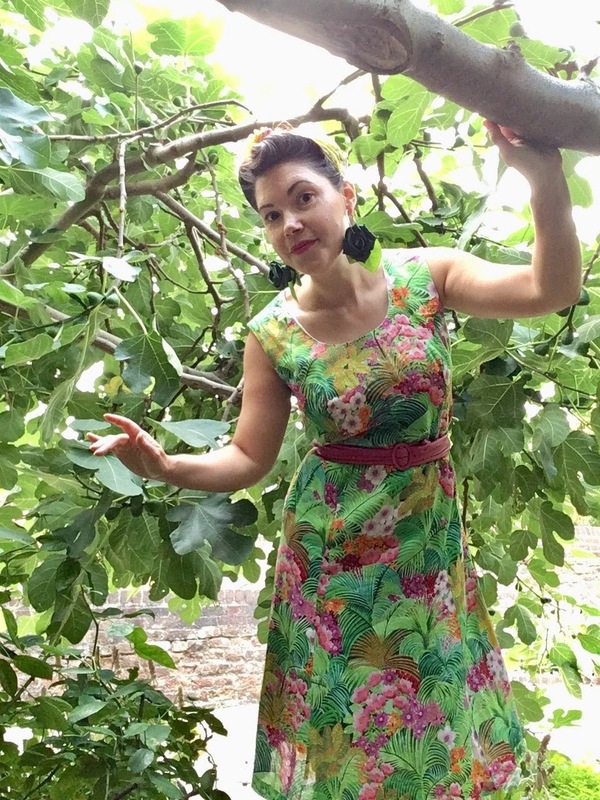 Lizzie from We Resonate makes her one-off dresses from vintage silk scarves. 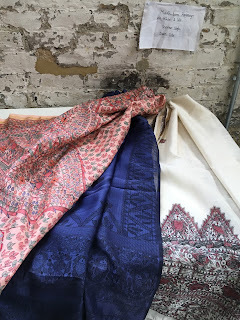 She recognised the importance of employing a good seamstress who could work with luxury fabrics, and wanted her brand of sustainable luxury to be truly handmade and unique. Lizzie and Kate from Fabrikk both talked about the high price points of their products relative to high street fashion. Huge economies of scale combined with the use of sweatshops has made the price of clothing and accessories artificially low. Paying a seamstress a London wage for her expertise means that We Resonate dresses are a good reflection of what good quality, unique clothes actually cost to make. Fabrikk make bags and accessories from cork, combining sustainable vegan materials with wearable tech to create handbags with interiors lit by LEDs; perfect for finding your wallet or keys in the dark! Like Bourgeois Boheme, who make smart and stylish vegan shoes, Kate wanted to find a leather alternative that wasn’t plastic-based, and had its own set of aesthetically pleasing qualities rather than simply being a substitute for leather. 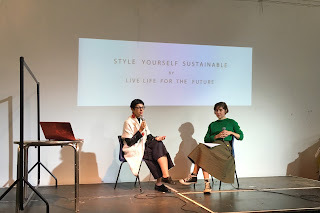 Alicia from Bourgeois Boheme talked about her interest in working with innovative new materials: while the leather industry is a major source of pollution (not to mention cruelty to animals) simply replacing leather with plastic poses its own set of sustainability problems. 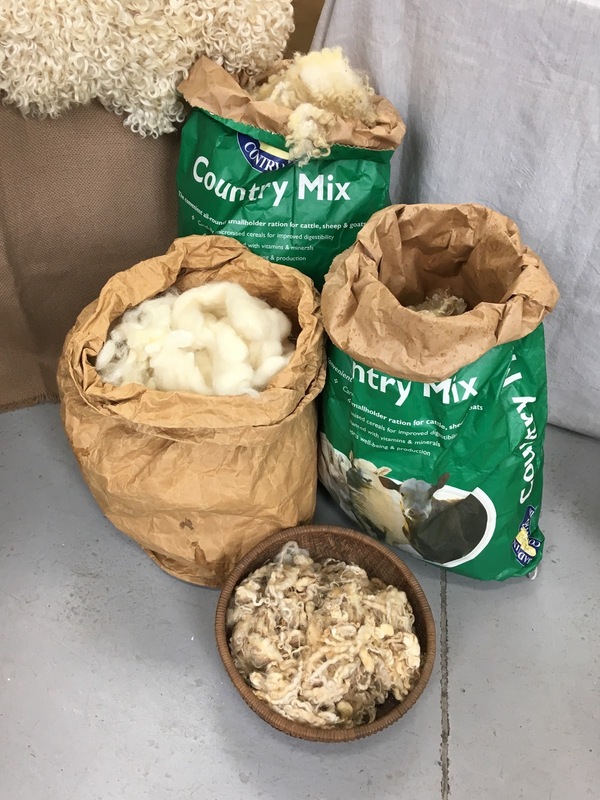 Bourgeois Boheme use materials like Pinatex, which is made from pineapple fibre, but working with new materials takes a lot of development and time, and many new sustainable materials are not at a stage in manufacture where they can be scaled quickly. While I love bold and striking sustainable innovations, I realise that statement dressing might not be everyone’s cup of tea. We also need to make sure the everyday clothes in our lives are sustainable, as these are the things that are going to get worn (and replaced) most often. 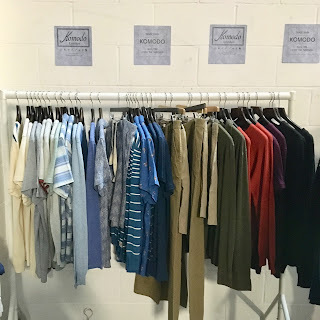 Komodo make eco-friendly wardrobe staples: soft organic cotton t-shirts and jumpers, and colourful bamboo socks, as well as stocking jeans from brands like MUD and Monkee Genes. 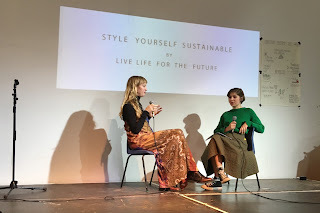 Seeing such a range of ethical brands was really encouraging; showing that sustainable fashion isn’t just one style but is available for everyone is really important. 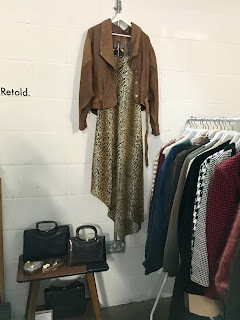 Of course, another excellent option is to buy secondhand, and Style Yourself Sustainable had a great selection of vintage sellers, who have each curated a beautiful selection of desirable vintage clothes. 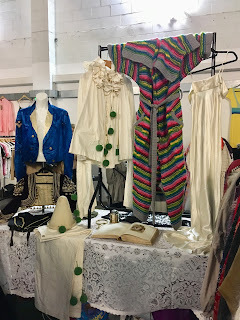 Lucinda Vintage has antique theatre costumes amongst her sparkly stock, Honeykins Vintage has a kaleidoscope of eye-catching prints and colours, and Retold Vintage has a very contemporary looking collection of classic pieces. There was also statement jewellery by Twisted Vintage, made from upcycled pieces of broken vintage jewellery cleverly remade into something unique. Manifesto Woman had a great selection of good quality secondhand clothing, including designer labels at very reasonable prices. 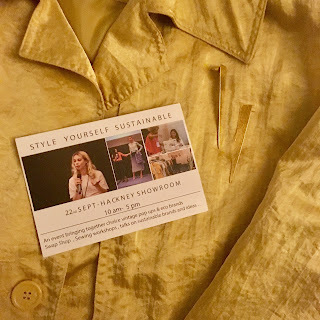 Style Yourself Sustainable also had a swap shop rail; I took along a few unwanted items and came away with a beaded vintage jacket! It’ll be making an appearance on Instagram soon, so keep an eye out for it! Sewing is an important skill when it comes to maintaining a sustainable wardrobe, and combined with some creativity we can use these skills to transform our clothes. Kate from Time to Sew taught a workshop where participants made a zero-waste skirt in an hour, showing that sewing doesn’t have to be time-consuming or complicated. The Style Yourself team taught a bag-making workshop; a good-quality tote bag is a must-have for a sustainable lifestyle, and a quick sewing project like this can improve confidence if you’re new to using a sewing machine. I also taught a short workshop, showing some easy options for mending clothes. 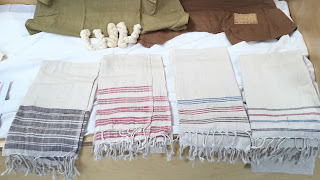 I brought along some samples from previous blog posts on hemming, and invisible mending, as well as demonstrating a basic darning technique and handsewing stitches. 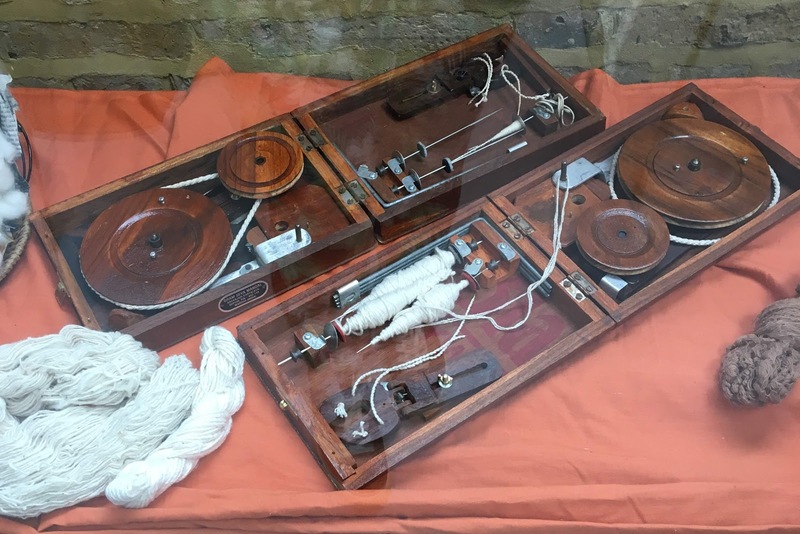 I wanted to show that sewing is accessible to anyone who can get their hands on a needle and thread, and an expensive sewing machine or fancy gadgets aren’t essential when it comes to repairing your clothes. Another important aspect of a sustainable wardrobe is, y’know, actually liking your clothes and wearing them! 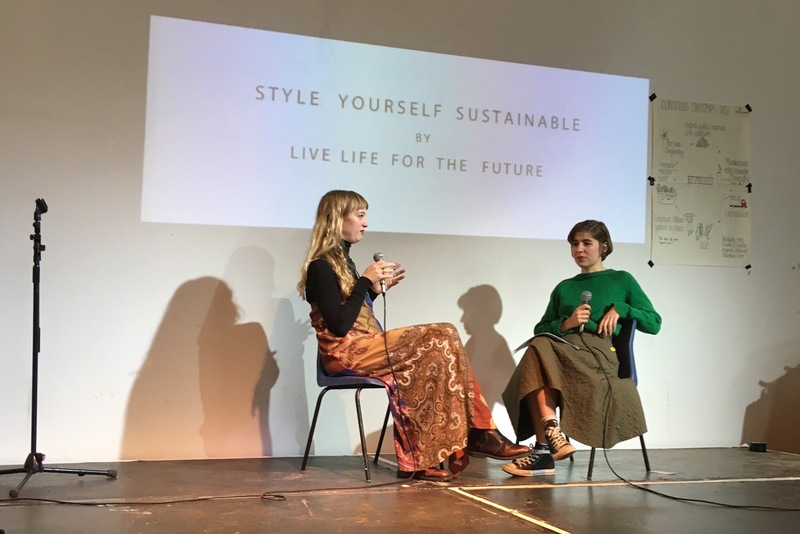 Alex from Sewrendipity, who describes herself as a “sustainable living striver” talked about her rules for owning a more mindful wardrobe. Alex advises shoppers to think carefully about what we add to our wardrobes, and to look for garments that will be with us for the long haul. She is a woman after my own heart, emphasising the importance of knowing what’s in your wardrobe and keeping track of what you wear regularly and why to inform future purchases. Alex also makes most of her own clothes, and talked about the way it had helped her to see her wardrobe differently; she knows how long clothes take to make, and the effort that goes into them. Roberta Lee from the Ethical Brand Directory also appeared via video to dispense some holistic style advice. Wearing our values should be a key factor in deciding what to wear; as well as reflecting our personalities and aspirations, our clothes should reflect the positive change we want to make in the world. Roberta’s work as a stylist, coach and sustainable fashion advocate are closely linked, and her stance on fashion resonates strongly with me: enjoying clothes and taking care of your appearance isn’t shallow, but it needs to align with your values to be truly empowering. The weather took a turn for the worse during the course of the day, with grey skies and pouring rain reminding me that I didn’t have a stylish waterproof coat. As if by magic, a gold rain mac caught my eye at Retold Vintage. I had planned to buy something in a neutral colour, but when I put the coat on in front of the mirror I couldn’t help but giggle with glee - the thought of putting on an actual ray of sunshine on a dreary morning really appealed. I also treated myself to a pair of earrings from We Are Africa so I can sparkle even on the gloomiest of autumn days! To me, this is what sustainable style is all about: clothes that bring you joy, that you can’t wait to wear over and over again. My Slow Fashion Summer: no new clothes for three months! I know some readers are probably rolling their eyes at the title for this week’s blog post. I know I am lucky to be able to afford new clothes fairly regularly, and that many people have to prioritise other expenses when they really do need new clothes for themselves or their families. Collaction's Slow Fashion Summer isn’t about shaming people for their shopping habits, it’s about challenging the way the fashion industry tries to drive consumer demand. With high street fashion chains launching new stock in store every couple of weeks, we are encouraged to become dissatisfied with our clothes faster than ever before. The average item of clothing is only worn four times before being discarded, so refusing to buy into this for a few months is a good way to reassess the way we shop. 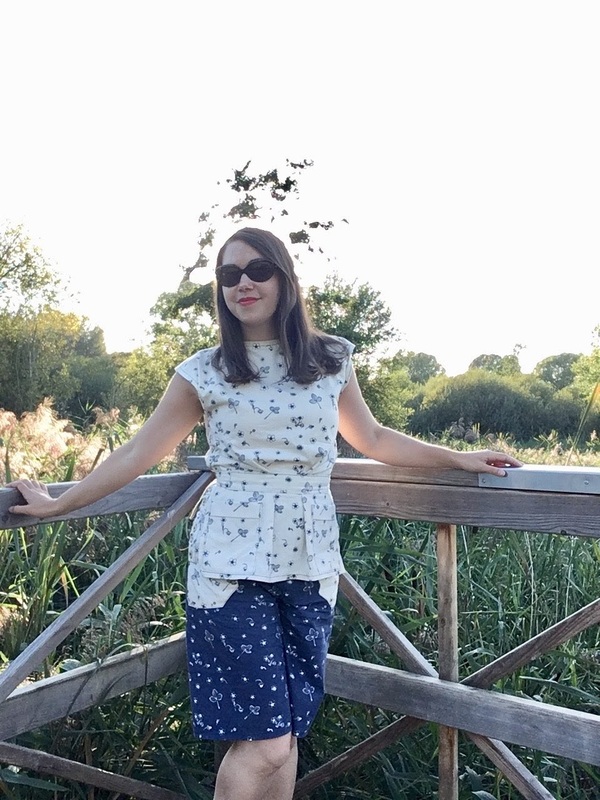 The rules of the Slow Fashion Challenge only stipulated no new clothes, so here are all the alternatives I found to ensure I could still have a fabulous summer wardrobe! 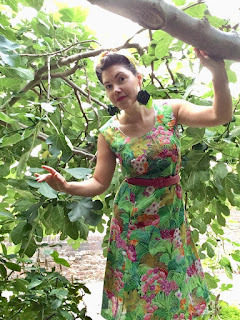 Being a vintage fashion fan means snapping up those bargains whenever you see them, so I bought summer dresses in the autumn and winter, then had to wait for the appropriate weather to wear them! The wait was worth it though; I’ve had so much enjoyment (and some lovely compliments!) 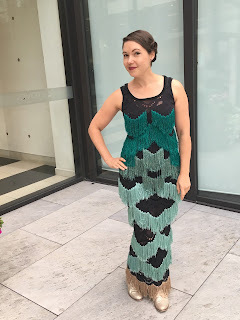 from wearing these fab frocks! You can check out some of my other vintage finds here. Even when we shop sensibly, we still end up with clothes that we don’t really wear any more. As well as rummaging through my sister’s cast-offs and picking out a few gems, I also went to Walk In Wardrobe and exchanged some of my old clothes for some lovely new ones! 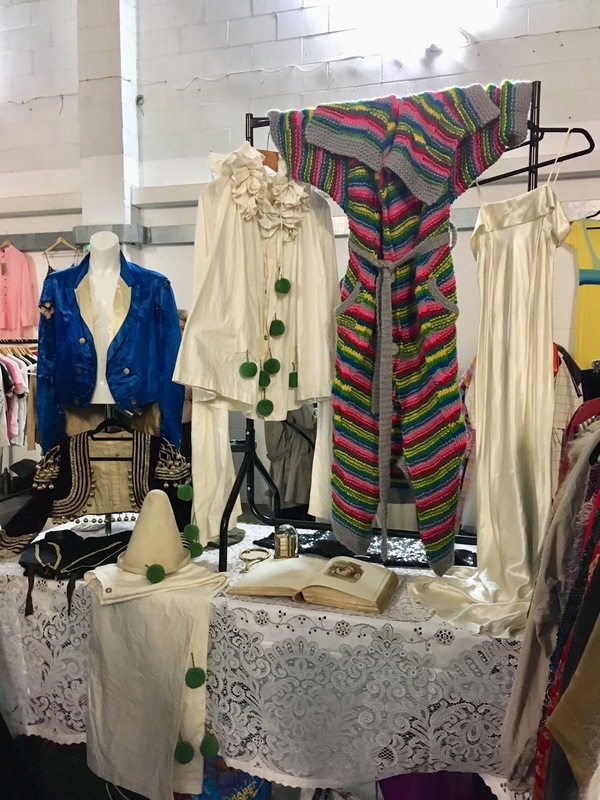 Stylist Daisy Schubert has come up with an innovative “rule” for her swap shop: you’re not limited to a number of items, you just have to try everything on to make sure you actually like it! That way everyone ends up with clothes they will actually wear, rather than more items destined for the back of the wardrobe. Giving to a good cause and stopping secondhand clothes from ending up in landfill means that buying clothes from charity shops is very much still allowed under the rules of the Slow Fashion Challenge! 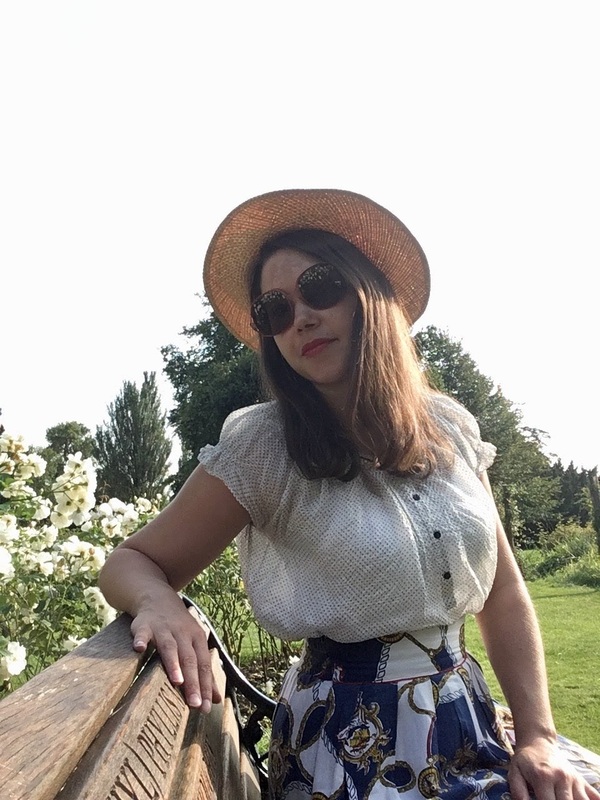 In the spirit of the challenge I didn’t indulge in a lot of impulse buys, but I did treat myself to this straw hat to keep myself cool in the heatwave! 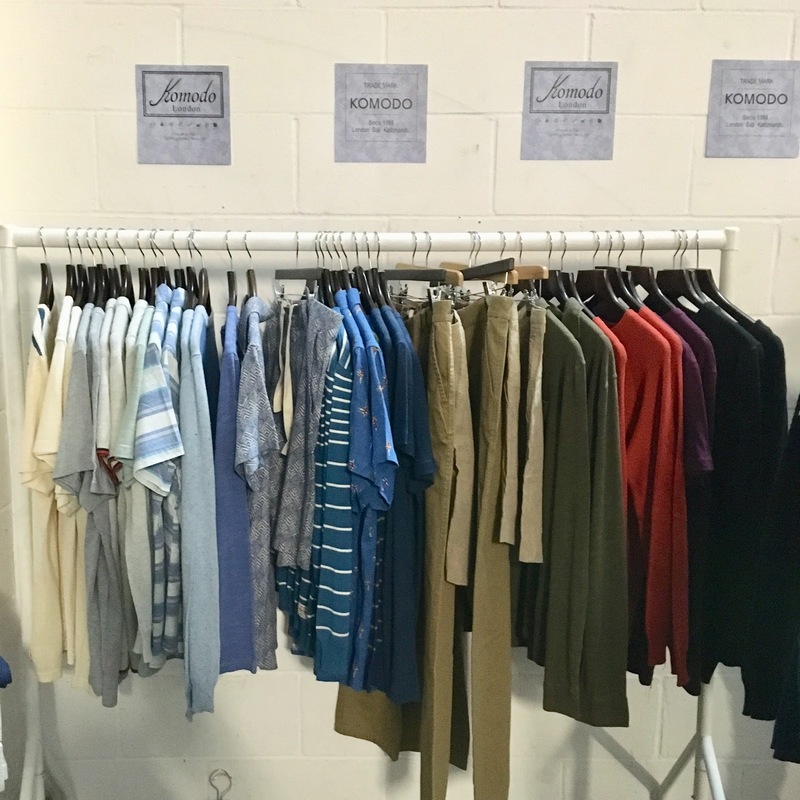 For anyone who is expected to have an ever-rotating wardrobe of fabulous clothes for events, clothing hire service Wear the Walk has you covered! I wrote about my experience hiring clothes from them in this post. I had picked up a silk playsuit at a clothes swap years ago because I loved the style, but I never really felt that the peach colour suited me. An hour with a bucket, a pair of thick rubber gloves and a sachet of hand dye, I had a playsuit that was much more my style! If you make your own clothes, it can be tempting to fall into the trap of impulse-buying new fabric for projects before you use up the fabric that’s already in your stash. And if, like me, you love buying vintage fabrics, special finds can end up cluttering up your cupboards for months while you wait for inspiration to strike! I only had a 70cm long piece of this blue fabric, and 90cms of the contrasting cream, so I knew I wanted to use them in the most efficient way possible. I ended up making this two-piece ensemble, with only a handful of scraps left over. I was also able to use up a few mother of pearl buttons from my button stash to add an interesting fastening detail. So, did I go three months without buying anything new? Almost. I’d like to think that my one new purchase was for a good reason, though. Sophie, the owner of Gung Ho Design, also runs monthly beach clean-ups on the Thames foreshore. Seeing an ethical brand owner really living her values made me want to support what she is doing, so I treated myself to a pair of Gung Ho earrings (as well as going to the beach clean-up, obviously)! 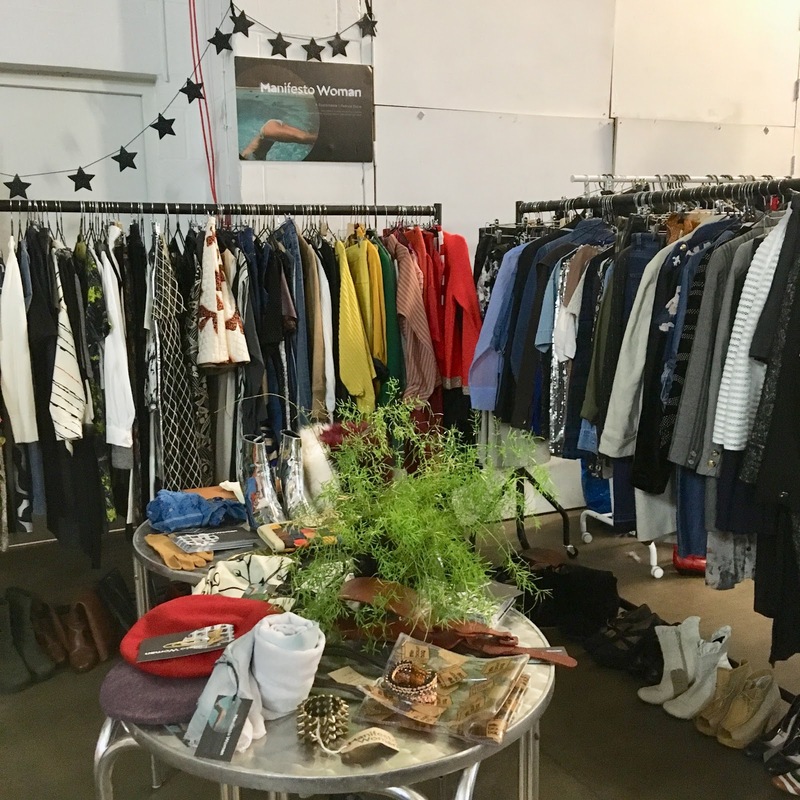 Knowing what we already have in our wardrobes, and thinking about how we can transform average clothes into clothes we love, or swap clothes we don’t love for clothes we do, means we don’t have to head to the shops nearly so often. 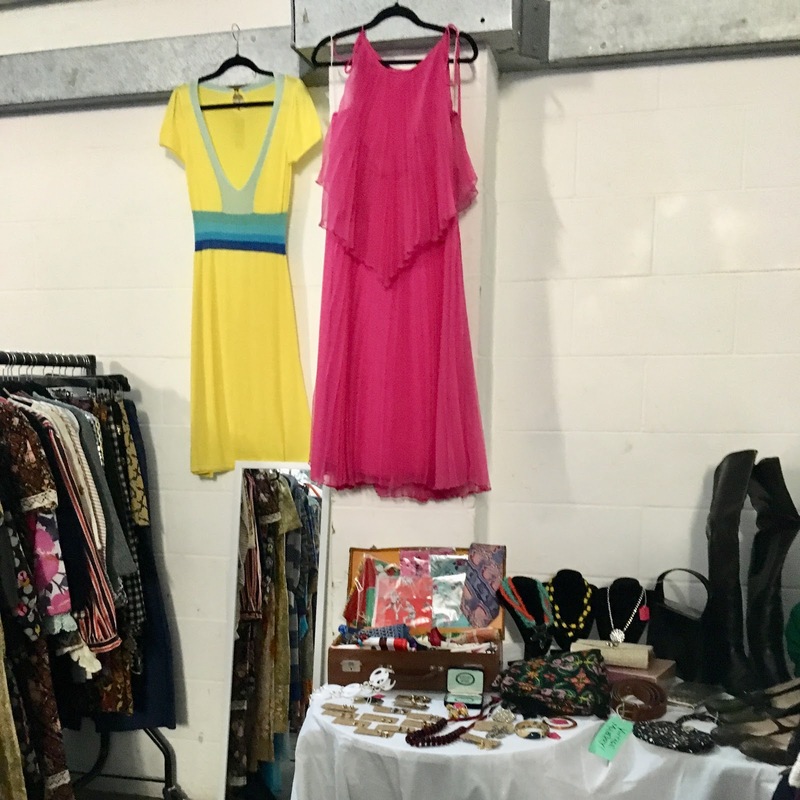 Organising or going to a clothes swap is much more sociable than filling our online shopping carts with impulse purchases, and sewing some simple alterations can make our clothes fit better, and give us a new appreciation for the people who made them! 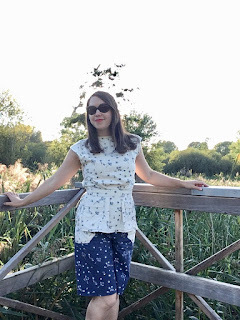 I might have to make a few new (ethical) clothing purchases as we head into autumn, but I’m also working on plenty of alteration and embellishment projects, so check back soon for more sustainable fashion inspiration! After a lovely mid-week mini-break at the Knepp Estate learning about rewilding, heading to the Festival of Natural Fibres at Craft Central felt like a good way to end a week of annual leave. Thinking about more sympathetic ways to use the land, making use of our natural resources and respecting skilled craftspeople rather than creating environmental devastation in pursuit of a never ending supply of cheap “stuff” felt like an important conversation to have across as many industries as possible. 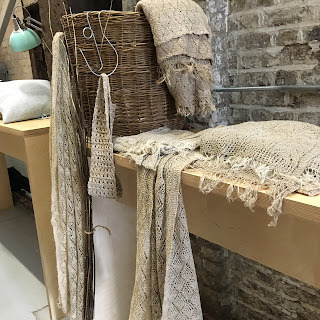 And the Festival of Natural Fibres really was a conversation. 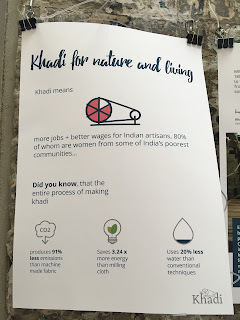 Organised by the Khadi Initiative , the event brought together British farmers, Indian cotton spinners and weavers, and the owners of sustainable brands who are truly committed to forming and maintaining sustainable supply chains to share their expertise. 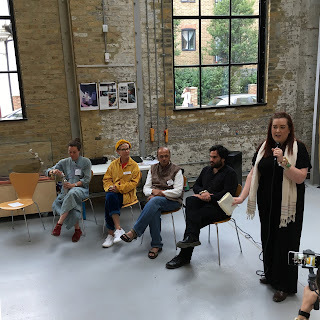 It was eye-opening to hear how wide-ranging the challenges are that face a truly sustainable fashion industry, but heartening to hear that so many people are working across industries and across continents to create a better industry for people and the planet. Rather than summarising each panel discussion, I’ve put together a list of the problems (some of which I didn’t even know we were facing) and their inspiring and creative solutions. The dark satanic mills of Britain’s Industrial Revolution, where adults and children alike toiled in dangerous working conditions, are thankfully a thing of the past. But when Britain sold off our outdated mill machinery, we not only destroyed a part of our heritage, but also the local economies that depended on these industries. The British climate is ideal for growing flax (linen was a traditional part of our textile industry), hemp, and sheep farming is a common feature of our landscape, but we no longer have the machinery capable of spinning or weaving a wide range of different fibres on an industrial scale. Affordability is always an issue when it comes to ethical and sustainable fashion. While it’s becoming aspirational for people in affluent areas, there is always the worry that it could just be a passing trend like any other. 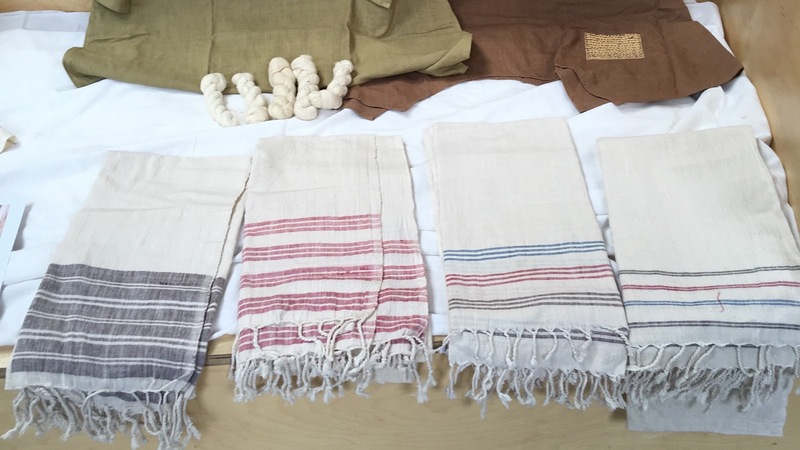 People on low incomes will have expenses they need to prioritise over organic or fair trade fibres, and there is no getting away from the convenience of easy-care synthetics that don’t need hand-washing or ironing. It was interesting to be at an event that actually connected the dots between these issues. Exploitation of natural resources, low wages and a lack of respect for the skill and craftsmanship of artisans has led to this unequal, throwaway society. Shailini from Moral Fibres summed it up perfectly when she said that we were “in the final stages of a deceitful system”. I loved the way Shailini spoke about the joys of both making and wearing clothes in a mindful way and how there should be a “tactile, respectful humanity embedded in all we wear”. 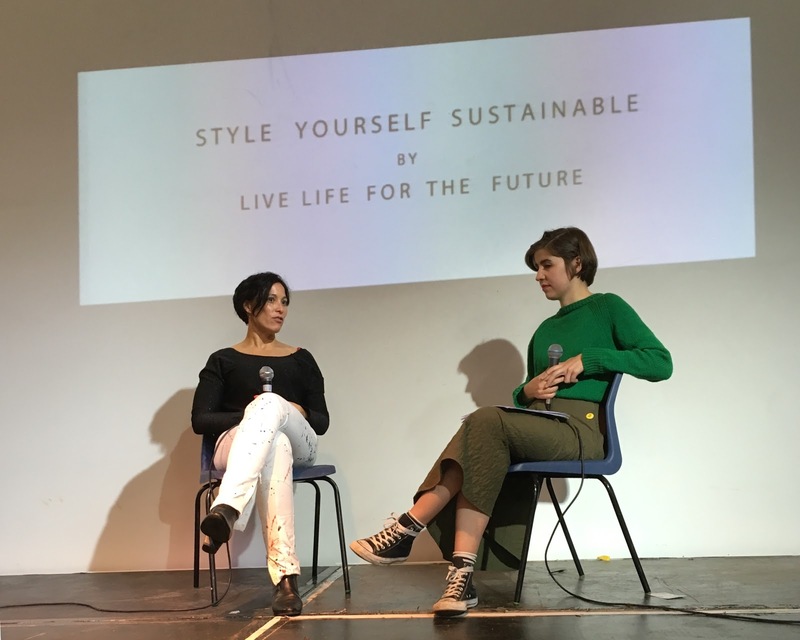 So what changes do we need to make to ensure that fashion is better for people and the planet, and how do natural fibres fit into this? 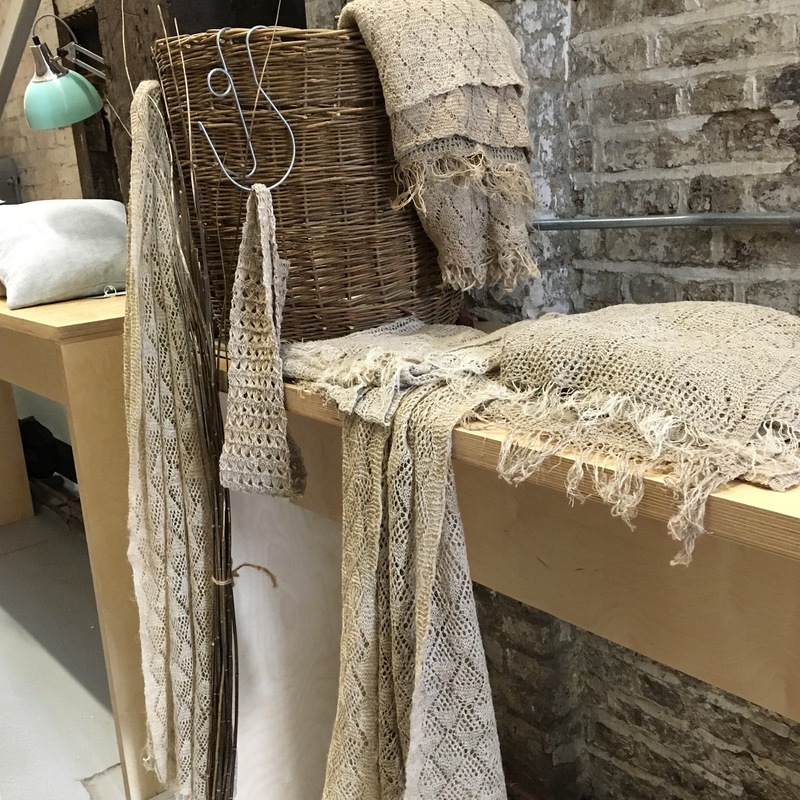 Could we revive our textile industry? 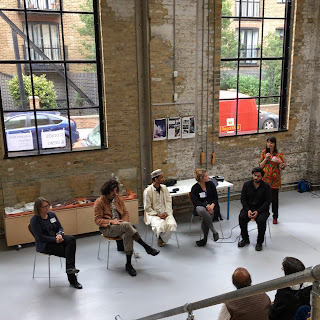 Several panellists spoke about their experiences trying to get fabrics woven from natural fibres in the UK. 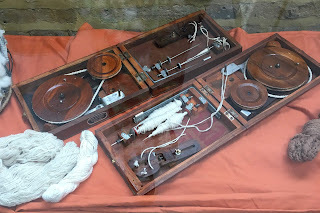 Current government policy ignores the needs of communities and the heritage industries they used to centre around (the focus of the idea of a “Northern Powerhouse” seems to be a fast train to London), but with investment in machinery we could be innovators and market leaders when it comes to spinning and weaving fibres like flax and hemp. The government would also have to relax their rules on the commercial growing of hemp, which currently requires a licence and may be subject to restriction depending on where the crop is grown. One of the problems that ethical entrepreneurs encounter is a lack of options for scaling their business slowly. The infrastructure doesn’t exist for mid-range manufacturing; artisans making handcrafted pieces mean the price point may be too high for many customers, and the minimums for corporate manufacture are too high for small business that are still establishing a customer base. Innovative new factories offering meaningful and fairly paid employment would be a solution to this problem. 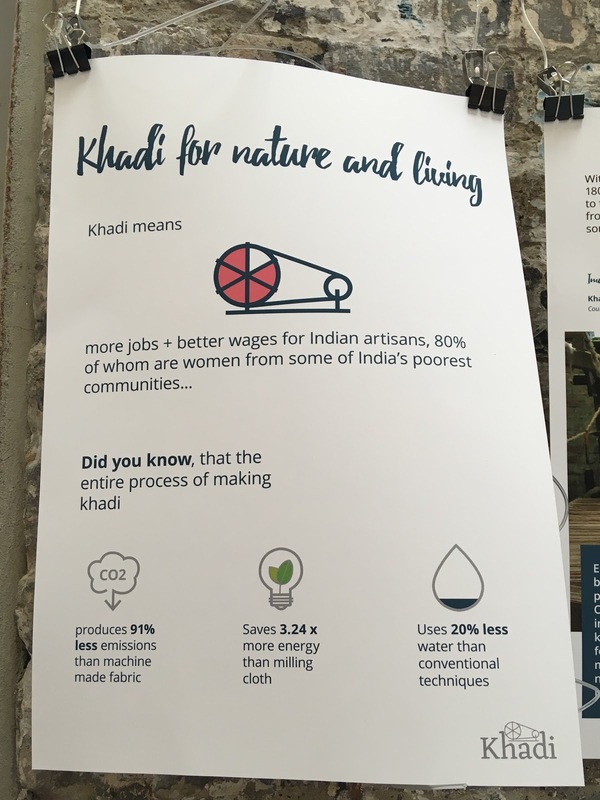 Getting people interested in natural fibres would help everyone feel more connected to both their clothes and the natural world. Better knowledge and understanding of the benefits could lead to more demand for clothes made from natural fibres from customers; sustainable brands can’t grow their businesses unless there is consumer demand. We shouldn’t just be focusing on clothes produced locally; sharing ideas and expertise with skilled craftspeople around the world would benefit the garment industry as a whole. As customers increasingly look for an experience or a sense of participation rather than just making purchases for the sake of it, ethical brands will be able to connect their customers with the stories and the people behind their clothes, making garments more personal and precious. We’ve had our eyes opened to the problems of plastic pollution, surely the realisation that garment manufacture is also a contributor to the degradation of the planet cannot be far behind. Hopefully we’ll begin to realise the importance of weighing the benefits of the artificially low prices of clothes against the detrimental effect to the health of people and the environment. When we consider our personal values, and think about the sort of world we want to live in, hopefully it will be one where we can appreciate the value in working with your hands, and embrace the unique qualities inherent in natural materials.